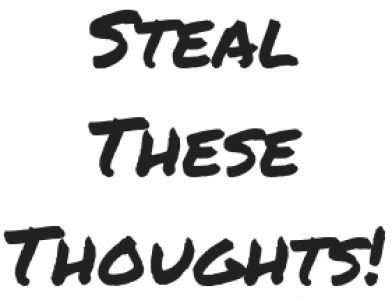 productivity – Steal These Thoughts! This isn’t an anti-productivity post, so all you life coaches and productivity gurus out there can calm down. In my line of work, I see streams of articles focused on improving people’s capability and supporting in their ongoing development (whatever that means for you). One point that seems present across many publications I read is on the concept of waking up super early to win the day, own the day or destroy the days as some of these have presented it. The time is upon us once more, a new year is here with a feeling of new beginnings for many. The infamous new year, new me movement is currently invading your local gym and many people are taking these first few weeks of the year to ponder what our resolutions for the year ahead should be. One of the most asked questions I have from people that read my blog and articles across other platforms has been around what do I consume to develop my own mindset, my skills and support in my continued evolution. Honestly you can. Mentors aren’t just people you have to meet in person, they can be the authors of the books you read, the hosts of the podcasts you listen to. This is the advice I’d give to anyone who wants to advance their career prospects and be a better human. If you’re not cultivating an approach and mindset of continuous learning, then you’ve resigned yourself to mediocrity. Dedicate 20% of your time every week to developing your skills and seeking new experiences. It’s a small thing that will allow you to keep evolving, be healthier and happier too. Our brains need stimulation with constant challenges, this enable us to push boundaries that allow us to discover more about ourselves. Take control of your own growth, stop watching Netflix or scrolling through the black hole of your social feed and invest that time in your most important commodity – you.